Most eBay users don’t know the extent of eBay’s seller-specific services. And sometimes sellers are so involved with selling that they don’t take the time to find out about new helper tools. Even if you’ve used some of these before, it might be time to revisit them because eBay has implemented quite a few changes during the past year. Did you know that you don’t have to accept bids from just anyone? Part of the business is watching your bidders. With bidding-management tools, you can save yourself a good deal of grief. The bidder contacts you to back out of the bid; choosing to be a nice guy, you let him or her out of the deal. You’re unable to verify the bidder’s identity through e-mail or the phone. You need to end the listing early. You’ll need the cancellation form to complete a bid cancellation. If you don’t want certain buyers bidding on your auctions, you can remove their capability to do so. Setting up a list of bidders that you don’t want to do business with is legal on eBay. If someone that you’ve blocked bids on your auction, a message will be displayed notifying the bidder that he or she can’t bid on the listing and should contact the seller for more information. Many eBay sellers bemoan the fact that international buyers bid on their items, when the items clearly state that they do not ship internationally. Also, they get upset when a bidder with minus-level feedback wins an item. Quit whining and do something about it! 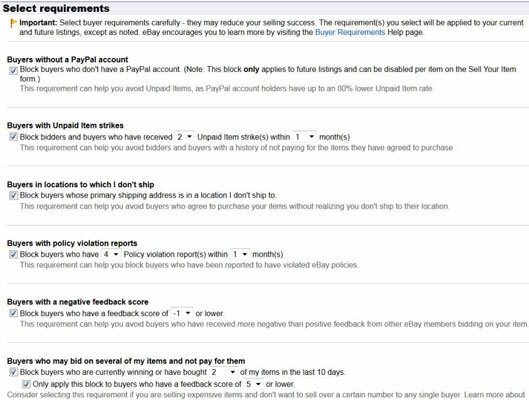 On your my eBay→Account→Site Preferences page, you can set defaults that will affect your bidders. On this page, scroll to Site Preferences: Buyer Requirements. If any of your bidders meet the requirements for blocking and attempt to bid, they will see a notice saying they are unable to bid. You can block as many as 5,000 users from buying your items. Use this option only when absolutely necessary. Situations — and people — change, and it’s best to try to clear up problems with particular bidders. You can block buyers from the Buyer/Bidders Management page. You may find a link at the bottom of your Selling Manager Pro page. You can reinstate a bidder at any time by going to the Blocked Bidder/Buyer List and deleting the bidder’s User ID from the list. You may decide to end a listing early for any number of reasons. If any bids are on your auction before ending it, you are duty-bound to sell to the highest bidder. So before ending an auction early, it’s polite to e-mail everyone in your bidder list, explaining why you’re canceling bids and closing the auction. If an egregious error in the item’s description is forcing you to take this action, let your bidders know whether you’re planning to relist the item with the correct information. After you’ve e-mailed all the bidders, you must then cancel their bids by using the bid cancelation form. When ending a listing that has bids, the seller has the option of canceling all bids or leaving the bids, thus making the high bidder the winner of the closed listing. To end a listing, use the drop-down list next to the listing on the Active Selling page. Click the More Actions drop-down menu next to the item and choose End Item to end your listing. An error occurred in the minimum bid or reserve amount. Perhaps your spouse really loves that lamp and said you’d better get some good money for it, but you started the auction at $1.00 with no reserve. In this case, it is better to go to the listing and make revisions. The listing has a major error in it. Maybe you misspelled a critical keyword in the title. The item was somehow lost or broken. Your dog ate it? It’s not a good idea to cancel an auction unless you absolutely have to because it’s bad business. People rely on your auctions being up for the stated amount of time. They may be planning to bid at the last minute, or they may just want to watch the action for a while. If you have bids on the item, you may be in violation of one of eBay’s policies.